This self-guided walking tour will be held on October 5th, 2013. The Freeland Markham house, built ~1905, was one of three houses belonging to members of the Markham family on Cleveland Street, and the only one still standing. It is the most architecturally impressive house remaining on Cleveland Street, with copious neoclassical Victorian detail. Many of the houses along Cleveland Street were built by small business owners. Constructed some time between 1907 and 1910, this two-story frame house is a distinguishable example of the late Victorian neoclassical styling popular at that time. On the side elevations,two-story, three-sided bays extend from the large boxy core with a steeply- pitched hipped roof and tall interior chimneys with corbelled stacks. The most striking feature of the house is the one-story wraparound porch with a second pedimented tier at the entrance bay; throughout both tiers, the supports are finely detailed Corinthian columns on brick plinths. Leaded glass transoms, sidelights and rondels embellish the front entrances. 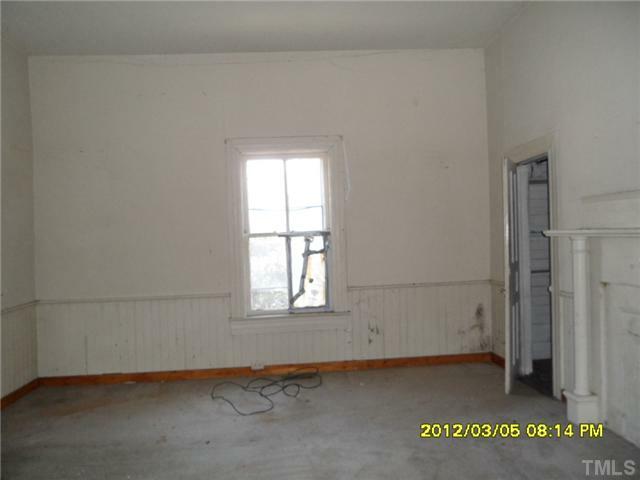 Although the house is somewhat deteriorated, its exterior is completely intact and the interior is little altered. 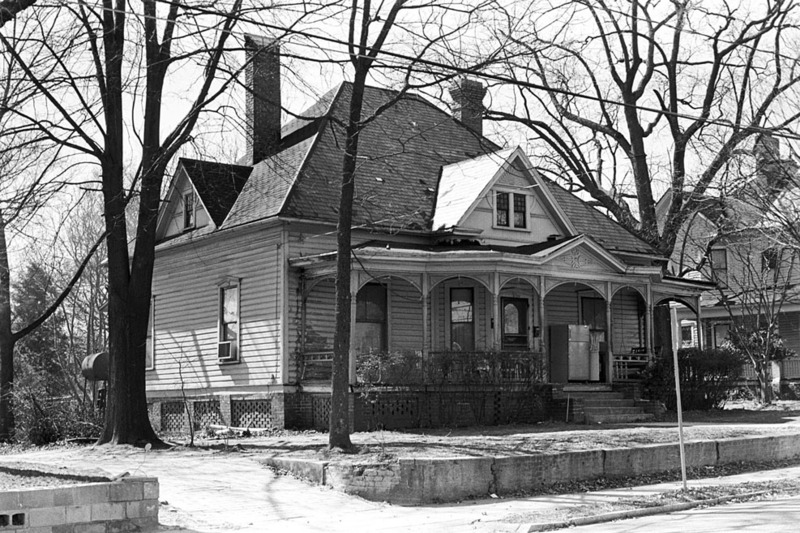 Matthew Freeland Markham, a partner in the Sneed-Markham-Taylor Company men's clothing store, had the house built and lived in it until his death in 1948. Today  the house is operated as a haven for derelicts. 1950 Sanborn Map (appears the same on the 1937 map) - now listed as 801. 801 Cleveland and the house across the street, 802 Cleveland, are both owned by Oscar Hicks of Creedmoor. It appears, as of 2006, to be a rooming house. 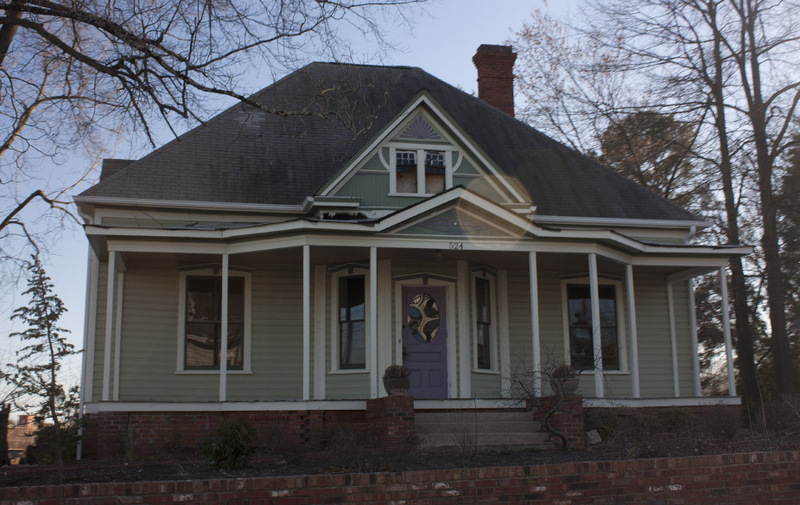 As of 2013, the house has been purchased by a homeowner who intends to renovate the entire house - what a win for Durham; this house deserves a full and loving renovation. Spacious upstairs room - 16 feet from door to end of the bay, 07.28.13. Stairwell after plaster restoration and painting. This side-gabled house is a traditional house form, and it is three bays wide and single-pile. The house appears on the 1913 Sanborn map and the earliest known resident is Mrs. Addie Ellington, widow of T. M. Ellington, in 1919. This side-gabled house is a traditional house form, and it is three bays wide and single-pile. The house has a stuccoed brick foundation, vinyl siding, and an asphalt-shingled roof. An exterior corbelled brick chimney rises at the left rear of the house. The hip-roofed, full-façade porch is supported by simple square posts with a replacement rail and stairs. Queen Anne-style brackets and turned pilasters are still visible where the porch joins the house. The house has replacement one-over-one vinyl windows throughout. There is a gabled-ell extending from the right (south) rear of the house, a shed-roofed block beyond the ell, and an enclosed shed-roofed porch within the ell. 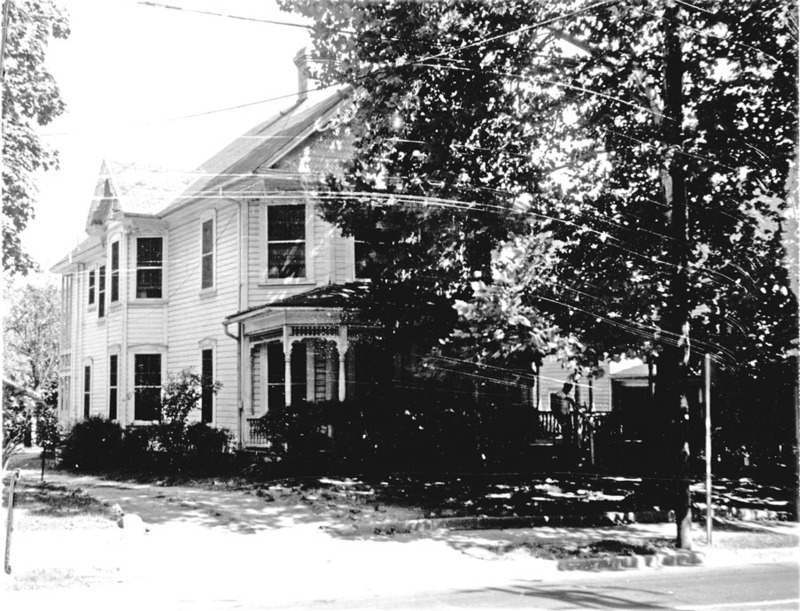 The house appears on the 1913 Sanborn map and the earliest known resident is Mrs. Addie Ellington, widow of T. M. Ellington, in 1919. 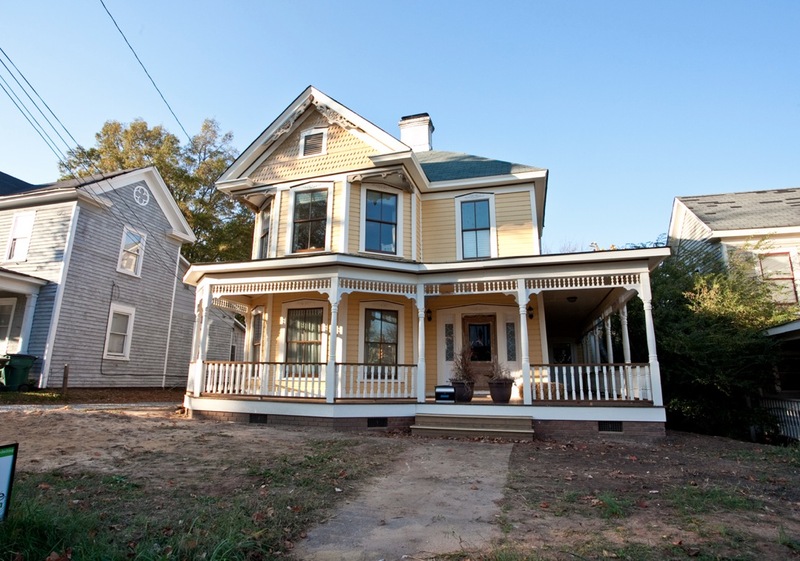 The house has been completely renovated as of 2013.
a large and lovely, early 20th Century two-story, five bays wide and three rooms deep, weatherboarded, Victorian house resting on a solid brick foundation. With the exception of a one-story, shed roof rear addition, the exterior is unaltered. 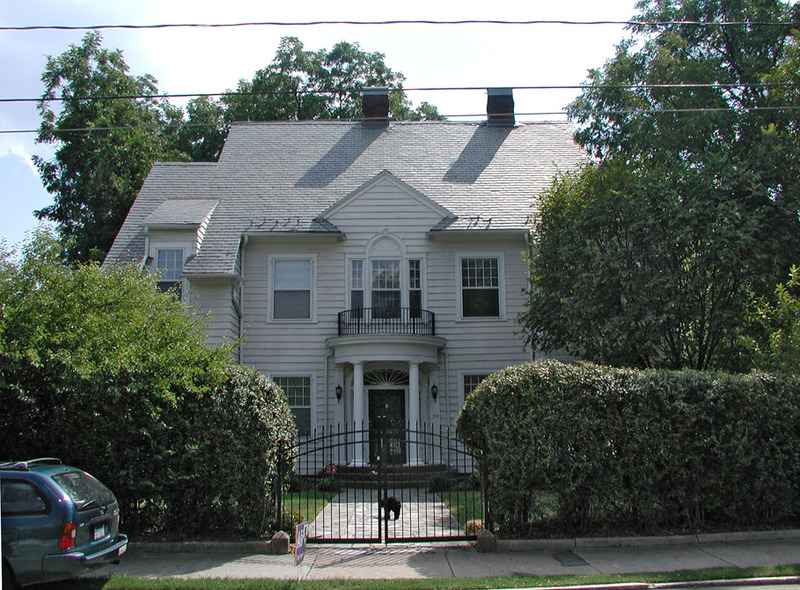 Two interior, brick chimneys break the asphalt shingled, high hip roof with boxed cornices, small pedimented side gables. and a large front gable with scroll and pendant cornice brackets which projects over a two-story, three-sided bay. 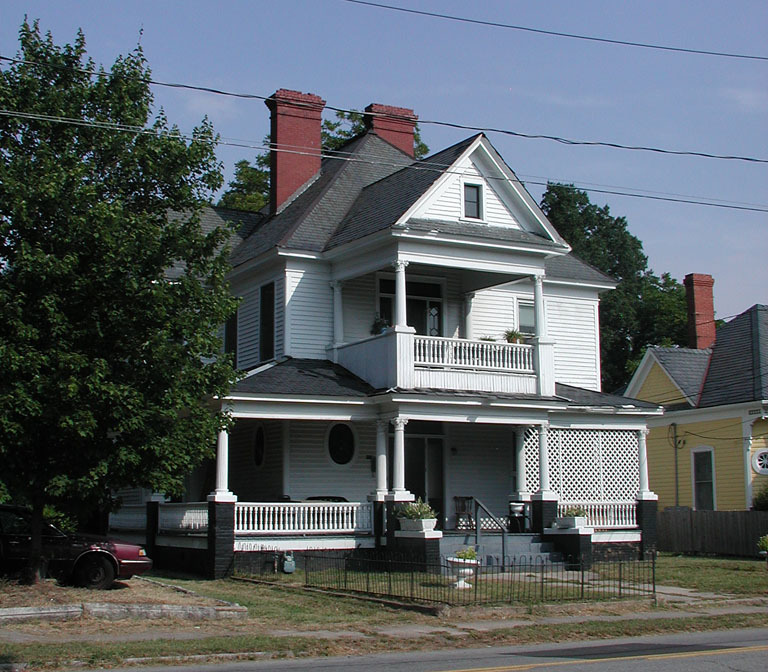 The attached, hip roof, wrap-around porch follows the contour of the building and is adorned with turned posts and balusters, a spindle frieze, and scrolled brackets. The windows are all trimmed with simple flat surrounds and the original front door has been replaced with two as the house has been divided into apartments. 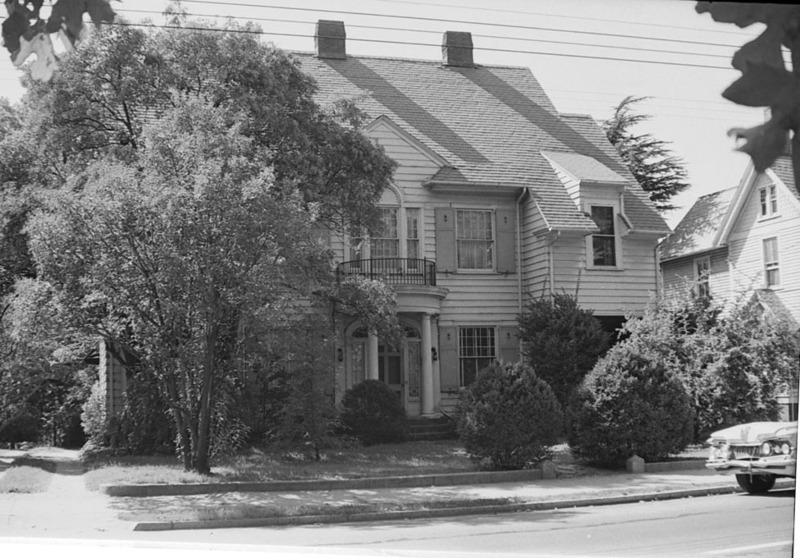 The division into a duplex is evident in the picture from the mid-1970s, below. It appears fairly well maintained, although the original 2-over-2 windows appear to have been replaced with single light windows (with loss of most of the pedimented casings,) and the porch rail replacement is too high with too-skinny balusters. At least they didn't replace the windows with Home Depot specials - the 6 over 6 with the fake plastic muntins (pane dividers). 2012 - from the homeowner's blog. Henry Wilkerson was an administrator at the Golden Belt Hosiery Mill. He had this house constructed, likely around the time the Hosiery Mill began operations nearby, in 1901. He and his wife lived here until they died. 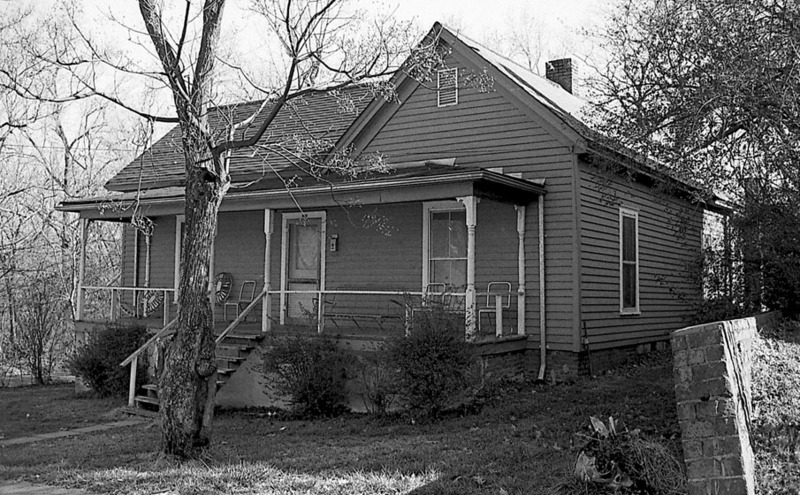 Mrs. Wilkerson's sister, Fanny Dossett, was the next owner of the house, and she also lived in this house until she died, soon after the above picture was taken. 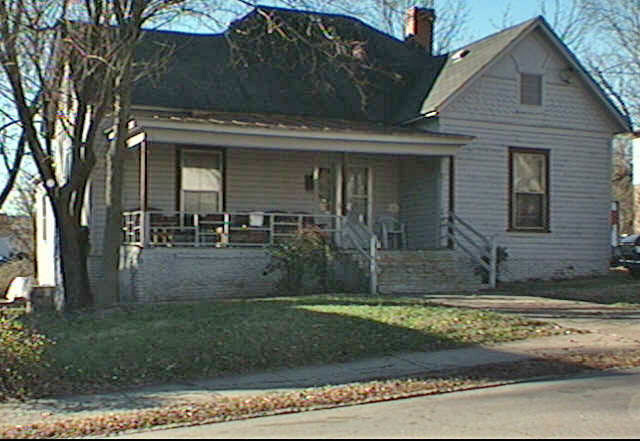 The house was subsequently turned into apartments, and began a slow decline. At some point, the most distinctive feature of the house - the elaborate, continuous porch brackets and turned posts that followed the polygonal front porch - was lost. The current owner is a landscaper, and has created an impressive backyard and, most recently, constructed a grand brick front entryway to the property. He is in the process of restoring the house. This one-story, triple-A-roofed house is four bays wide and single-pile with a stuccoed brick foundation, vinyl siding and soffits, and an asphalt-shingled roof. 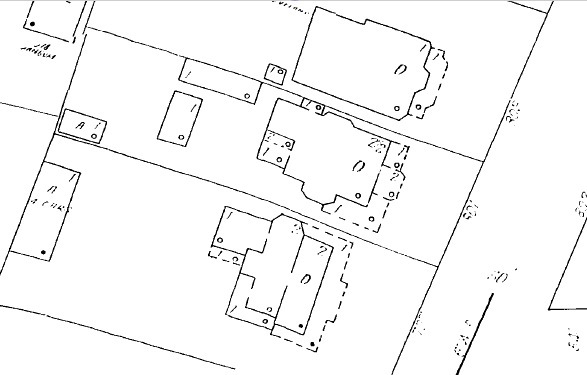 The house appears on the 1913 Sanborn map. 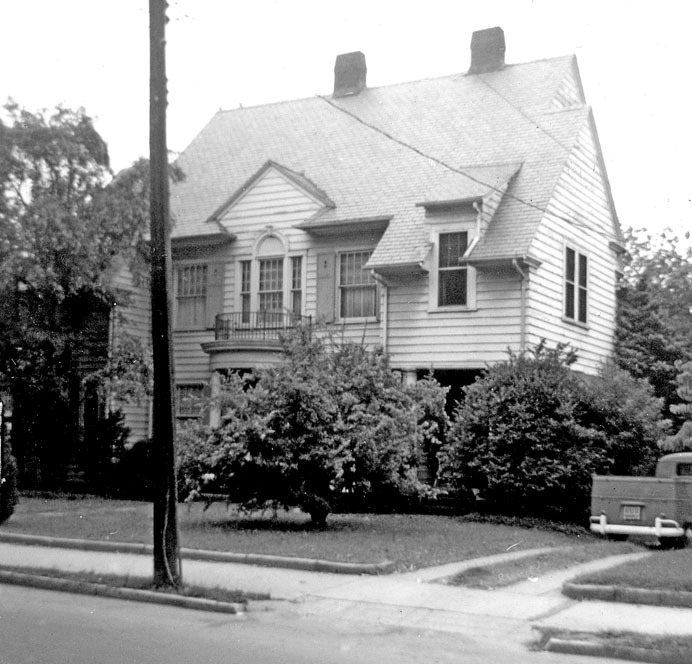 Early residents of the modest house were Ira F. Cates and Melvin Peed (clerk) in 1915, O. B. Tenney (electrician) in 1919, and Mrs. Emma Branch (widow and laundress) in 1924 and 1929. This one-story, triple-A-roofed house is four bays wide and single-pile with a stuccoed brick foundation, vinyl siding and soffits, and an asphalt-shingled roof. Remaining architectural features include imbricated shingles and a round vent in the front gable. 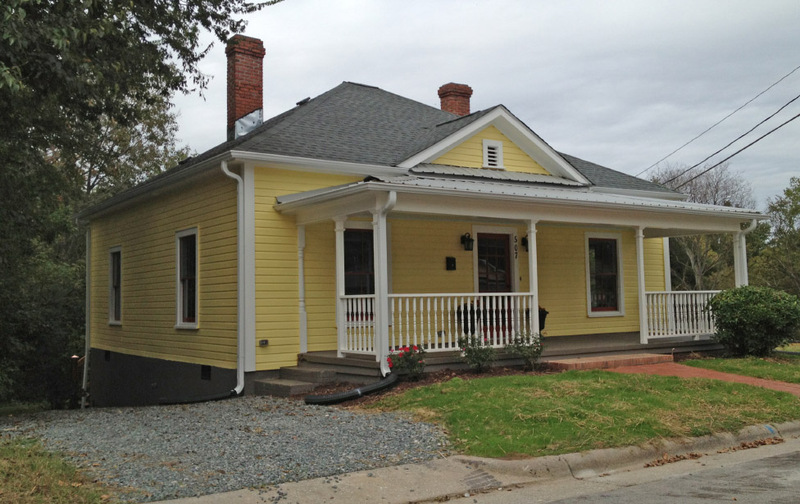 The hip-roofed front porch is supported by replacement turned posts and has a replacement modern rail. Windows are six-over-six vinyl and smaller than the originals. A one-story, gabled rear ell extends from the left (east) side of the house with a shed-roofed block (likely an enclosed porch) within the ell. 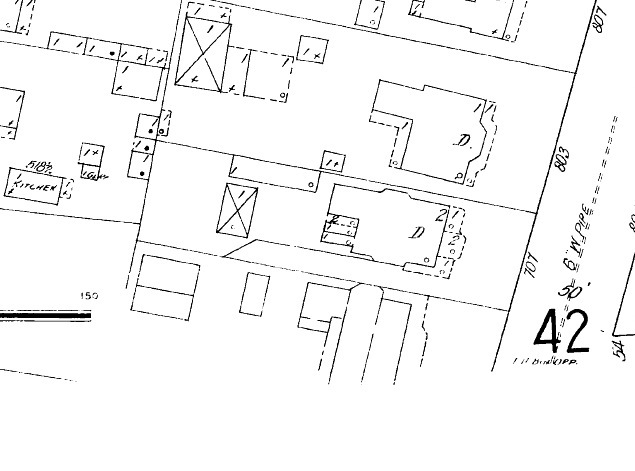 The house appears on the 1913 Sanborn map. 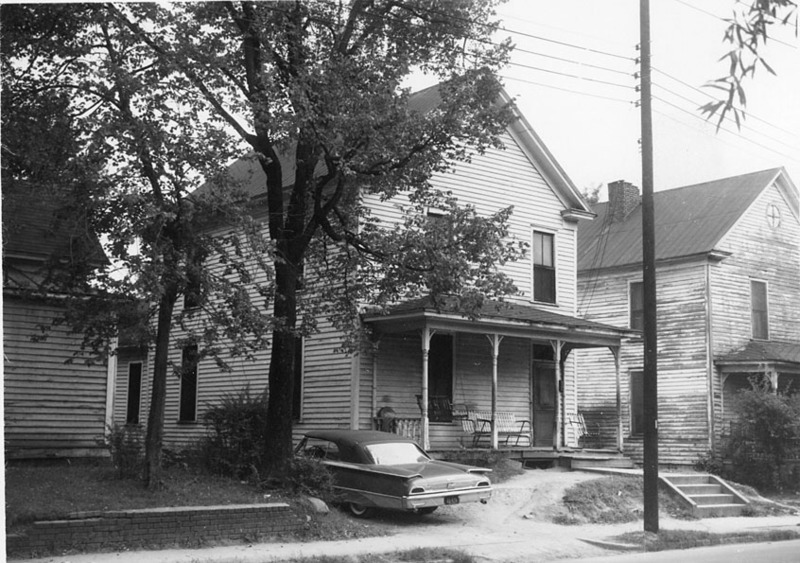 Early residents of the modest house were Ira F. Cates and Melvin Peed (clerk) in 1915, O. B. Tenney (electrician) in 1919, and Mrs. Emma Branch (widow and laundress) in 1924 and 1929. 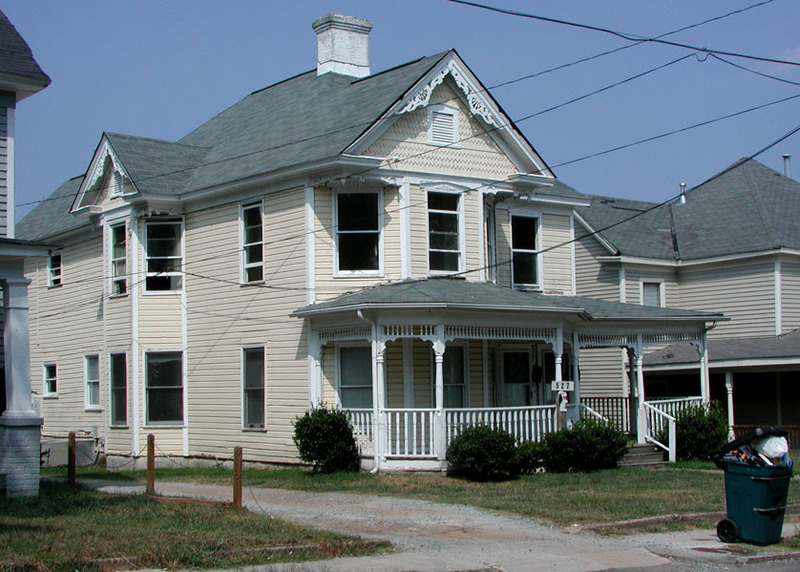 The R. Pearcy Reade house was built around 1900 by Mr. and Mrs. William B. McGary, who purchased the land from Julian Carr. Originally the house, like the others around it, was Victorian / Queen Anne in style. 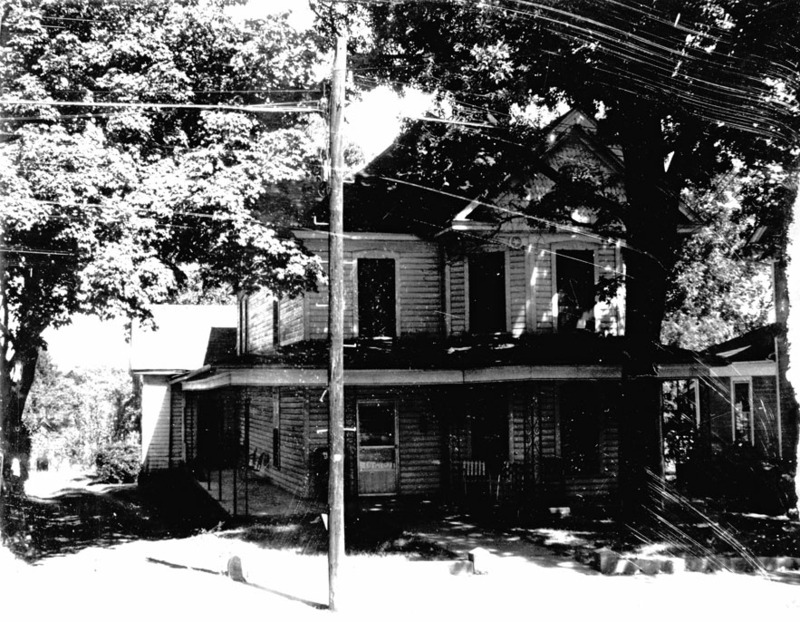 In 1909, R. Pearcy Reade purchased the house from the McGarys. In the late 1920s, he completely remodeled the house in a Colonial Revival style, building a new 'shell', as it were, around the original. The original walnut trim was retained in the house, although the mantels were replaced with Federalist style mantelpieces. 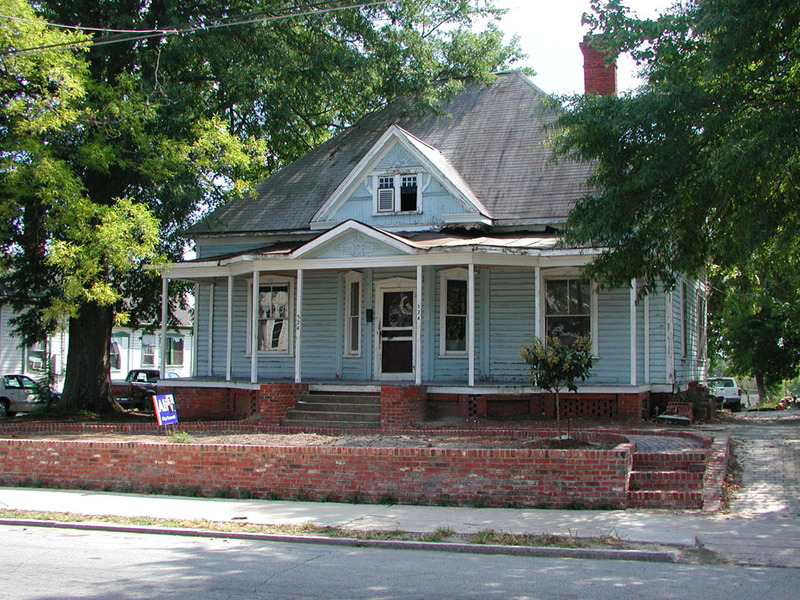 Mr. Reade served as Durham County Attorney for 50 years, and lived in this house from 1909 until his death in 1960. 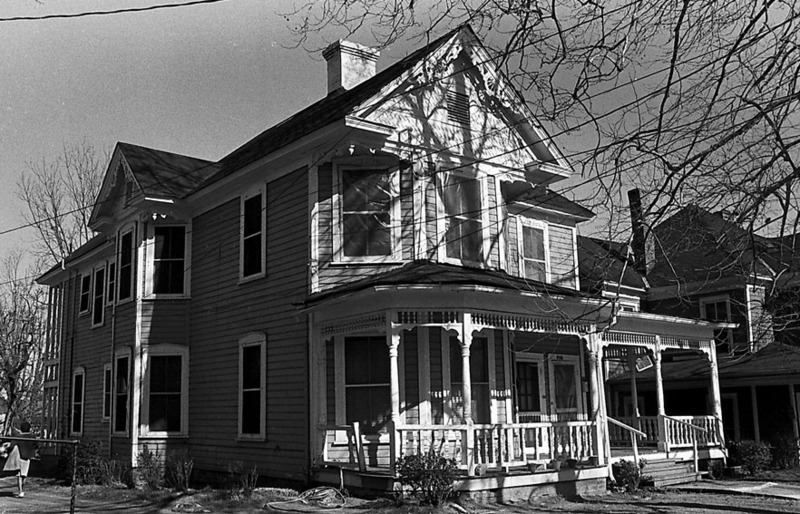 This house remained in good repair, and was renovated by Denise Barnes after she purchased the house in the mid 1980s. She lived in the house for ~ 15 years. 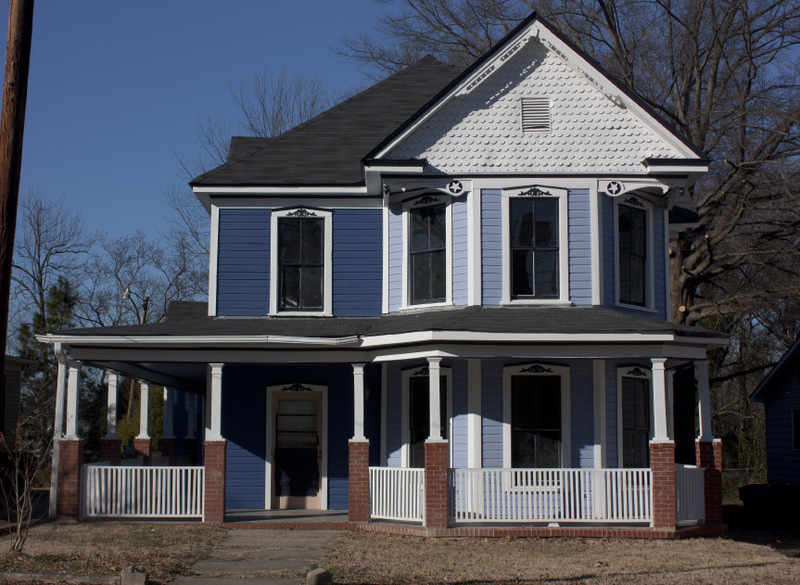 The current homeowner has done work to refurbish the house again, and it remains, interior and exterior, one of the finer owner-occupied pieces of architecture in the Cleveland-Holloway district. 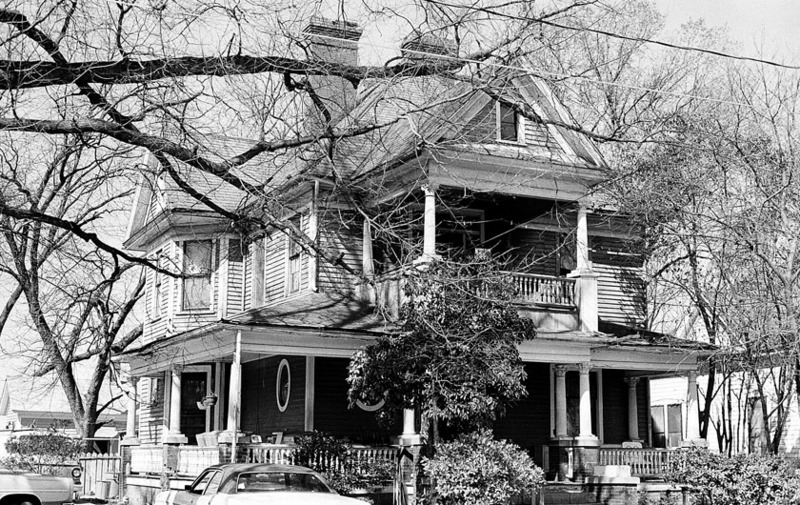 She wrote that 523 Holloway, a cross-gabled Victorian with a front-facing bay and large corner brackets, was "likely constructed by Robert (and Susan) Gilbert who purchased the property in the mid-1880s." When Robert Gilbert died in 1908, RM Jones, the owner of 521 Holloway, profiled yesterday, purchased 5 properties on the north side of Holloway. 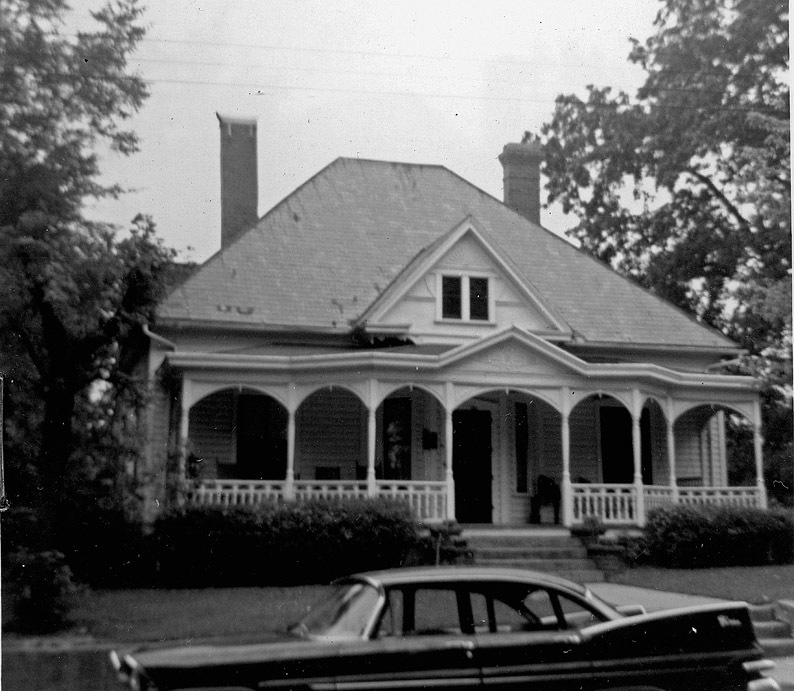 The above picture dates to 1964, at which point the house was not looking in the best of shape - and had already lost its original porch columns. 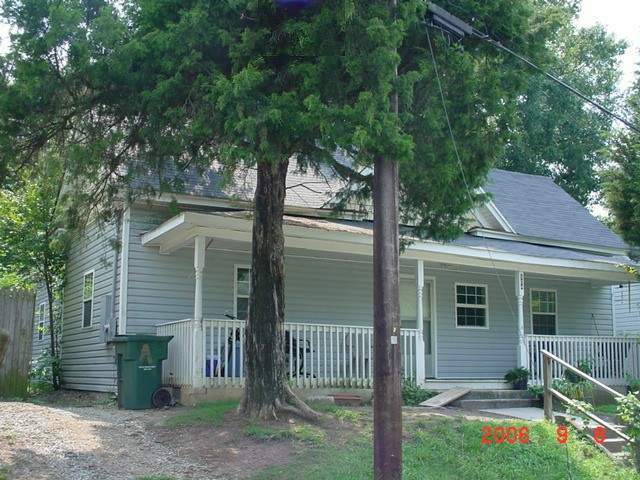 This post is an update - I posted on 523 in August of 2006, at which point I noted that the house had been vacant for several years, and was condemned. Looking northeast from Holloway St. - August 2006. 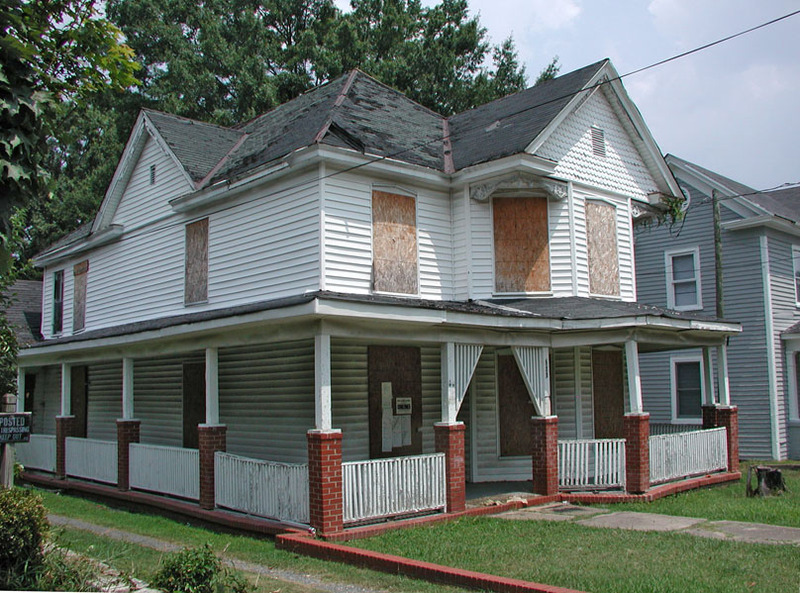 Fortunately, in November of 2006, it was purchased by the owner-occupant of 510 Holloway, who has been in the process of renovating the house over the past several months. A burning question that I don't have the answer to - what happened to the all of the big shade trees on Holloway? 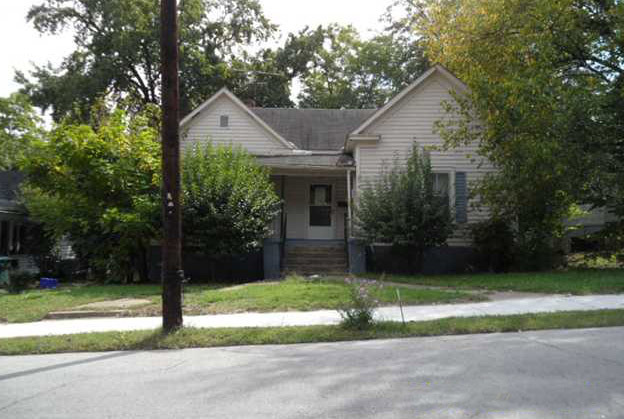 This one-story, triple-A-roofed house is three bays wide and single-pile with an engaged front porch supported by replacement square posts and accessed by an off-centered flight of stairs and ramp. 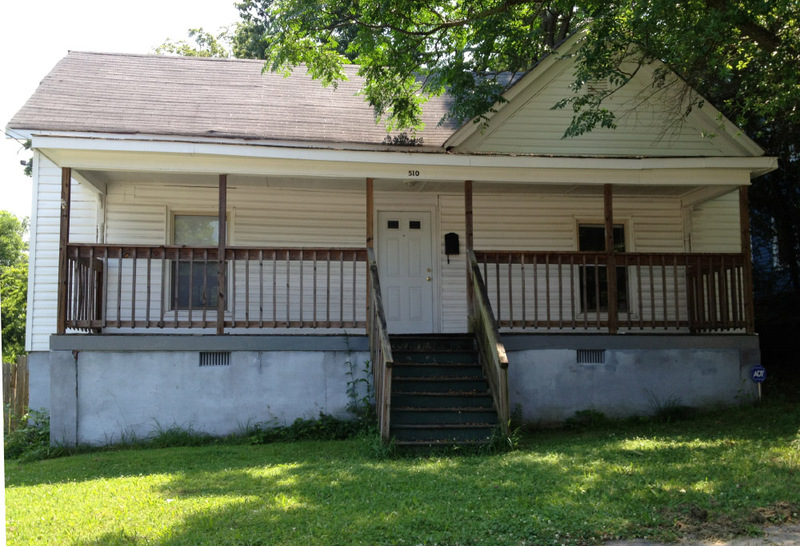 (The house formerly had two sets of steps to the front porch). The earliest known residents are Lewis Turner Wilcox and Mrs. Carrie Wilcox in 1911/12. Later residents include Beatrice, Dewey, & Walter M. Browning (upholsterer) in 1915/16. 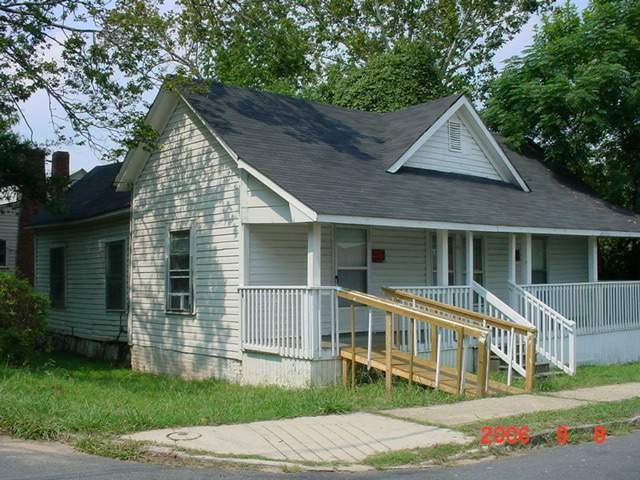 This one-story, triple-A-roofed house is three bays wide and single-pile with an engaged front porch supported by replacement square posts and accessed by an off-centered flight of stairs and ramp. 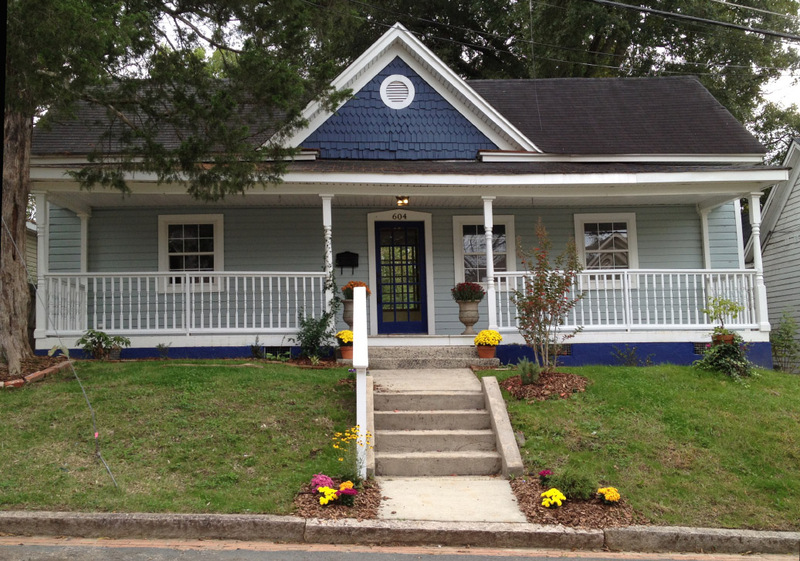 (The house formerly had two sets of steps to the front porch). The house has a stuccoed brick foundation, German-profile wood weatherboards, and an asphalt-shingled roof with vinyl soffits. The house has two-over-two windows at the front and a combination of one-over-one and two-over-two windows throughout the rest of the house. Constructed as a duplex, the house has two replacement doors flanking paired windows centered on the front façade. A gabled rear ell and two shed-roof additions define the back of the structure. 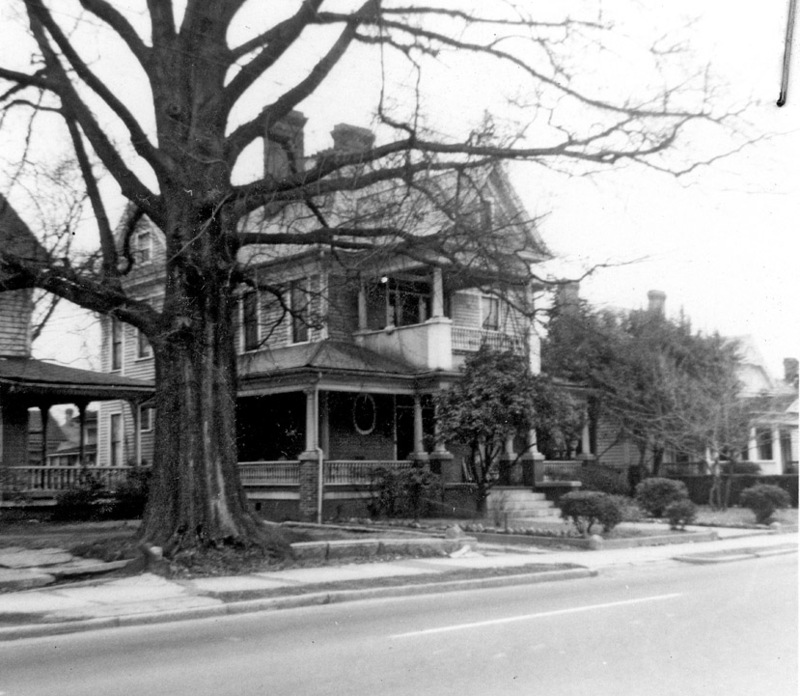 The earliest known residents are Lewis Turner Wilcox and Mrs. Carrie Wilcox in 1911/12. Later residents include Beatrice, Dewey, & Walter M. Browning (upholsterer) in 1915/16. So, the deal between the city and Housing for New Hope to essentially donate the eastern side of the 400 block of North Roxboro to the non-profit to construct a "10 unit apartment building for the homeless" is now public, in yesterday's Herald-Sun, which refers to the land as "nearly unusable." The catch in the 1 dollar deal is that the land has a steep drop-off and has a stream-path, likely subject to Neuse buffers. The article in the Herald-Sun fails to mention that the "nearly unusable" land was not useless until the city seized and demolished the 10 houses on this block as part of the urban renewal program in 1968. Looking southeast from Roxboro and Elliott/Seminary, 2007. This small area does not need another exclusively low-income/homeless housing facility. 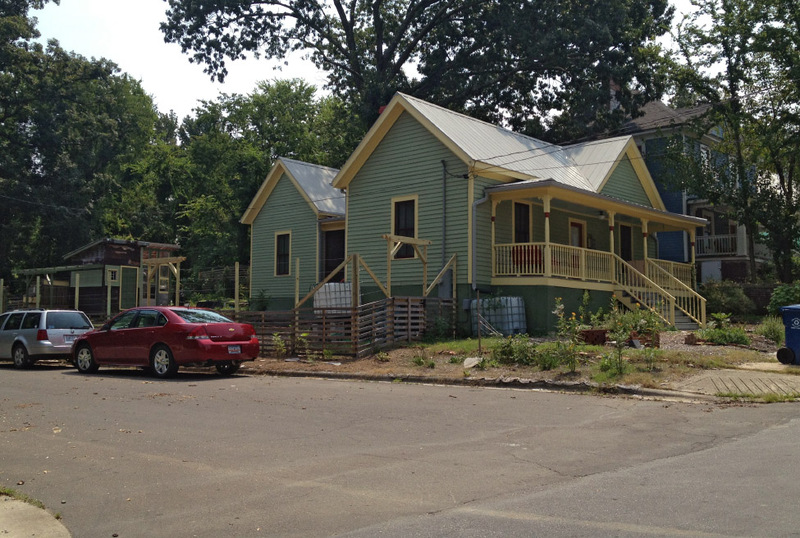 There are a bevy of such facilities / housing within a ~6 block radius from the intersection of Holloway and Dillard. The word on the street, although I've been unable to definitively confirm it, is that the city is entering into another deal for the large vacant parcel at Dillard and Holloway, one block away, to build "housing for at-risk youth". While the Feds recognized the mistake of highly concentrated neighborhood poverty, and adopted an economic diversity model for their HOPE VI program (an excellent program, now defunded - thanks to our current administration), the proliferation of multiple non-profits devoted to building low-income housing, and the availability of government money to fund their efforts has led to a competitive building frenzy by low-income housing producers. 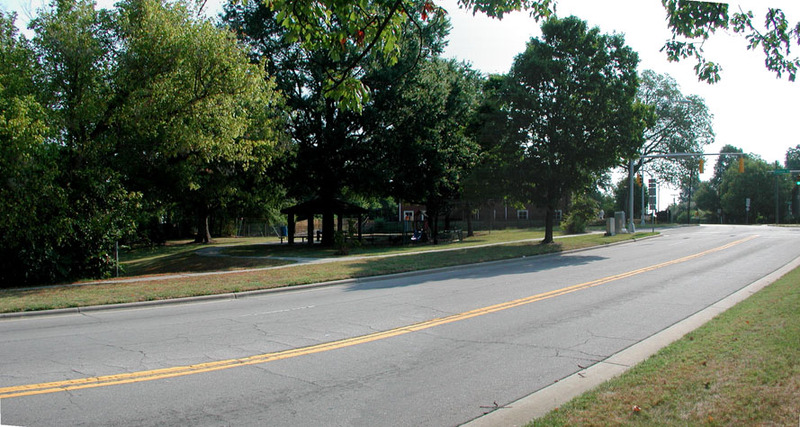 The lack of any small-area planning in Durham means that concentration where land is cheaper (or given away by the government, which is likely to occur where land is cheap) is a foregone conclusion, particularly when your city lacks inclusionary zoning or other policy to bring affordable housing to the suburbs. The struggle here is that providing for the failure of the private housing market is a good thing; we need housing options for people who cannot participate in that market. But you can have too much of a good thing. Some low-income housing advocates I speak with view the housing market in only those broad terms - they are fighting the good fight against the outpricing of low-income folks, and they must build as many as possible to keep up with that outpricing. But when that housing is concentrated in a small area, it essentially recreates some of the fundamental problems of housing projects - significant poverty, concentrated in a very small area, brings externalities. Home ownership is not a panacea, particularly when low-income residents may lack the funds for upkeep. 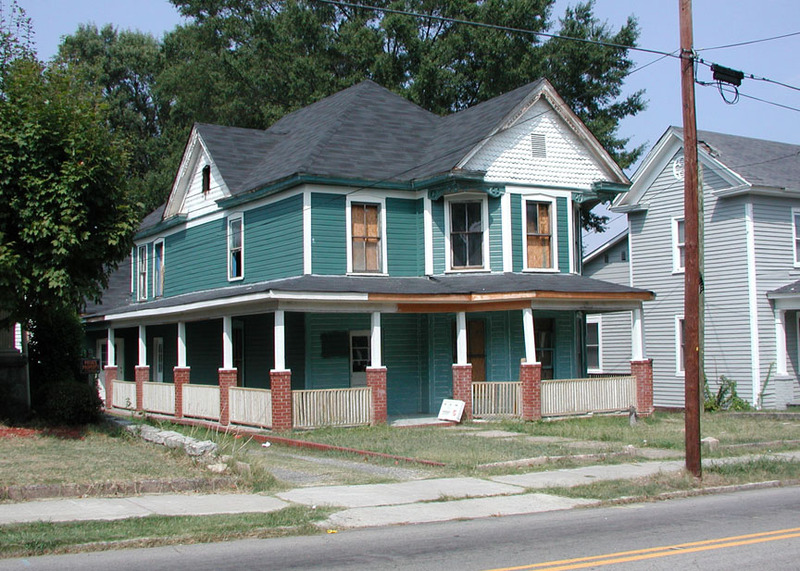 What is our affordable housing deficit in the city of Durham? No one knows. Do we have an affordability problem, or simply a housing/neighborhood quality problem (when houses are selling for K in East Durham, perhaps affordability isn't the issue.) How many units do we need - does Self-Help need to build 20 units of low-income housing in West End per year in perpetuity, as is their plan? No one is minding the store on location of government-funded housing by non-profits. This is another one of those issues that people avoid discussing - some conservatives find subsidized housing/government involvement in the housing market an anathema and tell you the whole business is a waste - get some vouchers. Some liberals will excoriate with invectives of classism, callousness or racism for even discussing the possibility that there could be too much low-income housing. Both of which avoid the difficult issue - the private housing market persistently fails for low-income people - in part because poverty can bring externalities of its own. We need affordable units - but the goal is to create mixed-income neighborhoods, with enough capital to fight for themselves, but enough affordability to provide for low-income residents. Because what is happening now is economic segregation - rich enclaves in one part of town, and the government-subsidized creation of the new ghettos in another part of town. Some are all too happy to build endless shelters, halfway houses, homeless apartments, and low-income housing within blocks of the Liberty St. Apartments / Oldham Towers housing projects at Dillard/Main/Liberty Sts and decry opposition. The arguments for such facilities are moralistic, and to object, one must be immoral. But one has to ask - do those advocates live on the east side of town? 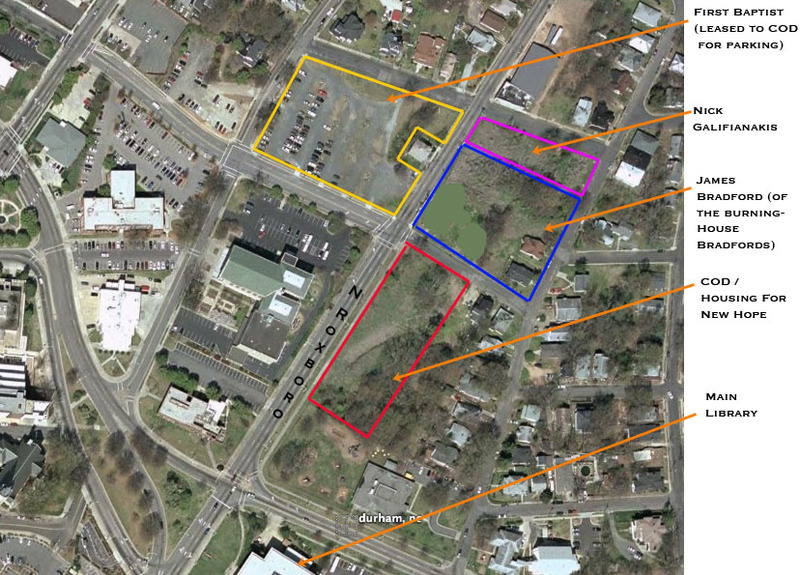 Would they locate 10-15 of the above facilities within blocks of their own house? If the (honest) answer is no - then the 'moral foundation' is simply noblesse oblige. My biggest concern has been that the East End has not been organized to shape its own future - and for those who want to demolish buildings/houses, build fortress-like county buildings, add another boarding house/halfway house/homeless shelter, move the library away, etc. - that's just fine. People here don't have the means (or the means to have the time) to hire an army of lawyers like Trinity Park has for 'The Chancellory'. Do you think anyone asked the neighborhood their opinion of the deal? I can tell you, definitively, no. I'm happy to say that the seeds of neighborhood cohesion are beginning, though. Push on a community long enough, and organization will occur. 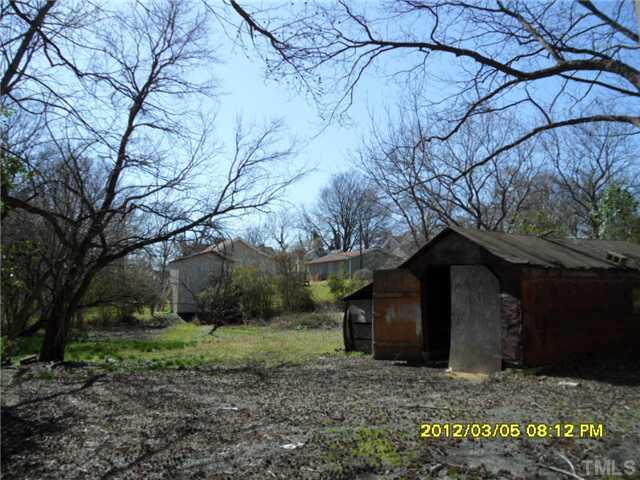 I hope Housing for New Hope will sit down with the neighborhood and ask what they'd like to see happen with the land; perhaps HFNH can partner with a private developer to provide low-income and market rate housing, or mixed-use development. Because this is a neighborhood - a mostly poor neighborhood. But they want the things that any neighborhood wants - laundromats, groceries, usable parks, entertainment, etc. It's time to stop treating this neighborhood like the hopes and self-determination of its residents are inconsequential. 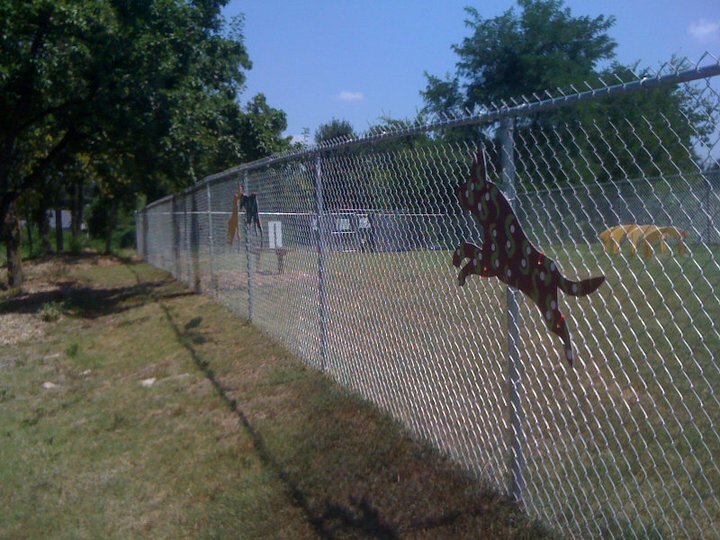 In May, 2011, the Downtown Durham dog park was opened on the south east corner of Roxboro and Elliott Streets. 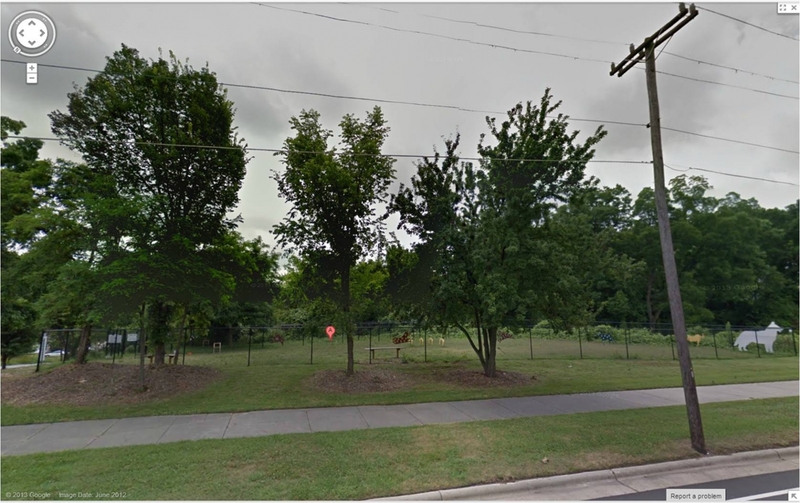 "The downtown Durham dog park was created through a special partnership between the City of Durham Parks and Recreation and the Cleveland-Holloway neighborhood on city owned land that has been vacant for over a decade." This pyramidal-roofed house with a gable over the front entrance retains its original form. The house is three bays wide and double-pile. A one-story, hip-roofed block extends from the right (north) rear of the house with a small, shed-roofed block within the ell (likely an enclosed porch). The house rests on a brick pier and curtain foundation and has two tall, interior corbelled brick chimneys. 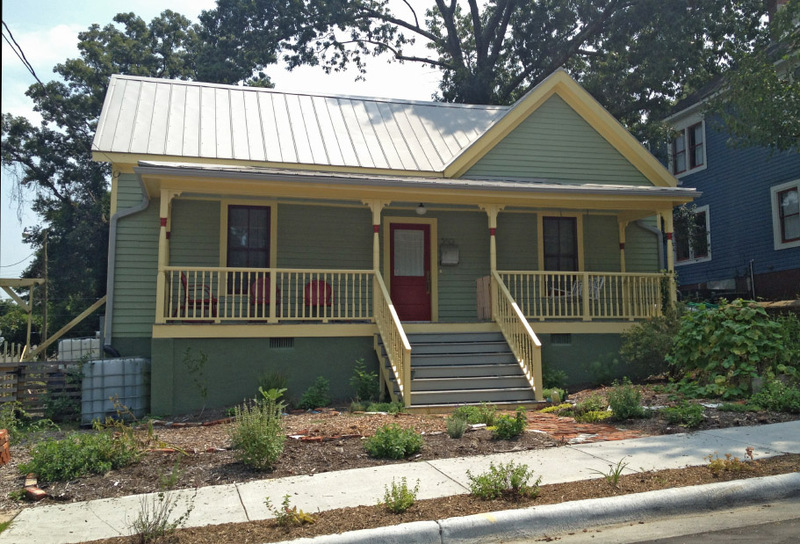 The house has been wrapped with vinyl siding and has replacement wrought-iron posts supporting a hip-roofed front porch. Windows have two-over-two wood sashes. Tax records indicate construction in 1920 and early occupants include U. H. Parker in 1924, Jesse S. Oakley in 1934, and Arthur W. Garrett in 1939. Looking northwest at the corner, 2007. Looking northeast, 1966, from the corner of N. Dillard and Holloway. Notice that Oakwood and Dillard did not connect with one another. You can see houses in the 300 block of Oakwood in the background. 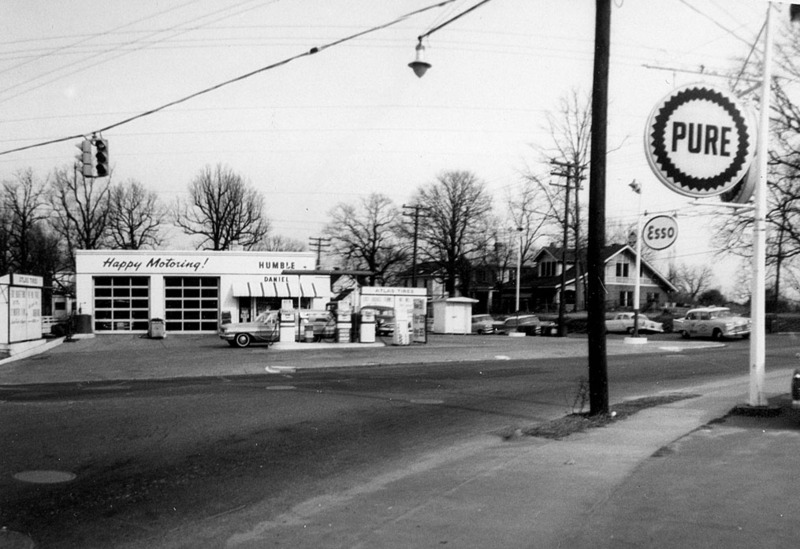 This gas station was taken as part of urban renewal and demolished. Part of the land went to connect Oakwood, Dillard, and Holloway into a 4-way intersection. The remainder became a park at some point, which it remains today. In urban design, we make a lot out of neighborhood parks, pocket parks, etc. - the small spaces within walking distance of the rest of the neighborhood. The success of these spaces, however, is very much context dependent and design dependent - you can't simply create a small park where you have leftover space and expect it to work. Because it clearly does not. One problem is the too-large roadway system here (not just the width, but the huge turning radii) with a lack of any on-street parking. These streets are not kid territory. And unfortunately, one of the costs to the neighborhood of having the Urban Ministries shelter 1 block away is that this park is filled with people from the shelter during the day (my understanding is that they must leave the shelter during the day.) Many of them are passed out/sleeping on the play equipment and lawn. I visited this park in several occasions over the summer (as part of my day job.) It is hard for a kid to use the slide when there is a grown man sleeping on the platform. (It wasn't me.) I watched several mothers walk by with their children - and repeatedly I saw the mothers tighten their grip on their children's hands and pull them closer as they walked by. One woman told me that she was "scared to death" of this park. So if your goal is for kids to be able to play and exercise, or for neighbors to feel like they could bring a book or their lunch there, the mission of this park is clearly failing. What should be an amenity to the neighborhood is widely viewed as a liability. Is some of this social stigma? Undoubtedly. But do we expect moms to tell their children to climb over the passed-out man on the slide? There is no easy solution to the problem presented here. This is the neighborhood context. While I would advocate for improving the streetscape here - it is not pedestrian friendly - I don't think that would do anything to help this park. Oakwood Park, looking northeast from Holloway St., 2007.